Who would suspect that the country bumpkin from Stratford on Avon would have any connection with a queen of England? An intriguing web of relationships involving the Neville, Arden, Webb, and Green families reveals several connections between William Shakespeare’s family and Catherine Parr, last queen of Henry VIII. Catherine Parr, born in 1512 or 1514 either at Kendal Castle, Kendal, Cumberland, or at Blackfriars in London, represents the religious controversy initiated by Henry VIII’s break with the Pope in 1534. She was probably raised as Catholic by her mother, her father having died when Catherine was five years old. She ultimately became devotedly Protestant and wrote two books on religion, Prayers or Meditations and The Lamentation of a Sinner, published while she was queen. She was closely related to the Throckmortons of Coughton Court, a militant Catholic family that engaged in nearly every plot against Queen Elizabeth and James I. Catherine’s determined Protestantism after 1543 was at odds with the Throckmorton side of her family as well as with the staunchly Catholic Ardens of Park Hall. Catherine’s second husband, Sir John Neville, 3rd Lord Latimer, was also a supporter of the Catholic Church. He had opposed the annulment of Henry VIII’s marriage to Catherine of Aragon, and in 1536 joined, perhaps reluctantly, in ‘The Pilgrimage of Grace,’ a Yorkshire uprising against Henry’s break with the Pope as well as social issues. Lord Neville and Catherine then spent the next seven years, until his death, in disgrace and in some danger. At one point, Catherine and Sir John’s children of a prior marriage were held hostage and their house was ransacked. Physical and emotional strain over the penalties Catholics endured may have turned her from the Catholic faith in which she was raised in favor of the safety of the new state religion. After her marriage to Henry VIII in 1543, Catherine became embroiled in the controversy concerning the right of everyone to read and study the Bible. She favored this right, a Protestant position, but conservatives in the Church of England, still essentially Catholic in Sacraments and ritual, warned that citizens would grow to think for themselves, lessening Henry VIII’s control. She was accused of heresy, and Henry went so far as to sign the warrant for her arrest, but she managed to convince him that she was only trying to divert him from his physical pain with her theological arguments. To some of her very Catholic relatives, she surely was a heretic according to their concept of the ‘true’ Catholic church as opposed to Henry’s new reformed church. These family members (young William Shakespeare among them?) must have viewed her with a mixture of pride that their family could boast of their Queen of England, and shame at her turning away from the Catholic faith. William Arden (d 1545) = Elizabeth Conway | of John Neville 1493-1543, | | John Neville = Catherine | | Parr in 1533. If John Neville and his wife, Catherine Parr visited John’s nephew, Richard Neville, Richard would have been between 10 years of age when they married and around 20 when John Neville’s died in 1543. Barbara Arden, Mary Arden’s cousin, was around 8 years old at this time, and Mary Arden, Shakespeare’s mother, would have been around 6 years old. Even if they had not encountered each other personally, the families would have been aware of the relationships, and Mary Arden Shakespeare’s family were probably proud of their royal relative although they differed on religion. As noted, Shakespeare’s mother was distantly related to the very Catholic Throckmortons of Coughton Court via Edward Arden of Park Hall’s marriage to Mary Throckmorton (1543-1643). Catherine Parr was a descendant of the Throckmortons through her mother, Maud (also known as Matilda) Green Parr (1492-1531), granddaughter of Sir Thomas Green and Matilda Throckmorton (1425- 1496). Matilda was the sister of Thomas Throckmorton (1412-1472) of Coughton Court, who was both the great, great grandfather of Mary Throckmorton, Edward Arden’s wife, and the great uncle of Catherine Parr. Catherine Parr’s great grandmother, Maude Throckmorton, was the daughter of Sir John Throckmorton and Eleanor de la Spine, Heiress of Coughton. The relationship among these families is very difficult to untangle and probably more difficult to decipher from the evidence presented here. However, the families would probably have understood and recognized the relationships. The diagram below may add clarity. These families clung to their Catholic faith and had to confront the political/religious conflict that began in Queen Catherine Parr’s day. Catherine Parr had a “trusty and well beloved servant, Sir Henry Alexander Webbe (1510-1544), gentleman, usher of her privy chamber" whose lands had been confiscated by Henry VIII during the suppression of the monasteries . A letter Catherine Parr sent her council asking them to grant her friend, Sir Henry Webb, the lands and estates still exists. He was also knighted by Queen Catherine and granted a Coat of Arms (Parr. Complete Works and Correspondence, p 57). Sir Henry was born 11 May 1510, the son of Sir John Alexander Webb, Jr. (1484-1516) and Margaret Arden Webb. His sister Abigail married Richard Shakespeare, and they were the parents of John Shakespeare, father of William Shakespeare. Sir Henry married cousins, Margaret Arden and Grace Arden. He and Margaret were the parents of Sir Alexander Webb, Jr., Kt (1559-1629), who immigrated to America. He then married the cousin of his wife Margaret, Grace Webb, and they were the parents of Agnes O’Dell Hill Webb who married Robert Arden of Wilmcote (1506-1556), William Shakespeare’s grandfather. Agnes became stepmother (although they were cousins) to Shakespeare’s mother after Robert Arden’s first wife, Mary Webb (1512-1550) died. 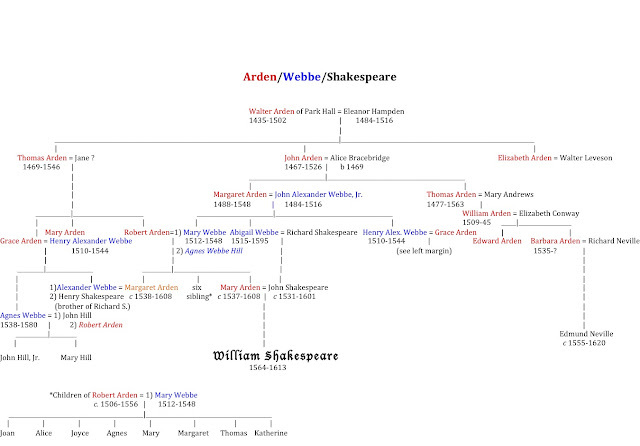 Little information is available about the Webb family, but because of their intricate intermarriage with the Catholic Ardens and Shakespeares, it is probably that they, too, were Catholic. The Arden, Webbe, and Shakespeare families were very inbred as can be seen in the diagram of WEBBE/ARDEN/SHAKESPEARE families below. Henry Alexander Webbe even has a tenuous link with Shakespeare’s life in London: through theater associate James Burbage and with Shakespeare’s patron and relative, Henry Wriothesley. In 1922, Charlotte Stopes identified a link between Henry Wriothesley, Burbage and the Theatre, Burbage’s first theatre, built in 1576, and Susan Webbe, daughter of Sir Henry Alexander Webbe: “A close friend of Henry Wriothesley’s, the Earl of Rutland, [Roger Manners, 5th Earl of Rutland (1576-1612)] had a town house on part of the old Holywell Priory Estates, of which the other part, granted to Henry Webbe, was eventually sold to Gyles Alleyn and let to James Burbage, who was then in trouble with his landlord (Stopes, The Third Earl of Southampton, 93). Stopes identified Susan’s father, Sir Henry Alexander Webbe (1510-154), as “a servant of Queen Katharine” (Stopes, The Third Earl . . . 486). After Sir Henry died in 1544, his daughter, Susan, and her husband George Peckham, inherited his property in the old Holywell Priory. George Peckham was a nephew of Thomas Wriothesley (1505- 1550) who opposed Queen Catherine Parr’s protestant theology. Thomas was the grandfather of Henry Wriothesley, 3rd Earl of Southampton (1573-1624), friend and patron of Shakespeare. The year after Sir Henry died, his daughter Susan and her husband George Peckham mortgaged the property to Christopher Alleyn and Alleyn’s son Giles. Susan died in childbirth in December 1555, and after her death, George became a leader in an enterprise to allow Catholics to immigrate to the New World to avoid penalties imposed by the Elizabethan government. In 1574 he joined with Sir Humphrey Gilbert in exploring and planning the settlement of Newfoundland. Eventually, he was imprisoned in England as a recusant and died in 1608. His attempts to relieve the repression of Catholics in England suggest that he, too, was a Catholic. The perilous voyages of these explorers were precursors of the 1609 voyage that ran aground in the Bermudas and is thought to figure in Shakespeare’s Tempest. It seems more than coincidental that a member of Shakespeare’s Arden/Webbe family participated in the transfer of property for the building of the Theater. Recall that Sir Henry’s wife was Grace Arden. To take this a step further, because of Sir Henry Webbe’s close work association with Catherine Parr, it is probable that his wife, Grace Arden, and some of Grace’s family would have been acquainted with the future queen. These Ardens, Sir Henry Alexander Webbe, and James Burbage were all citizens of Stratford on Avon who were well acquainted with each other. Shakespeare’s seeming knowledge of the lifestyle of the upper class is often questioned and regarded as incongruous with his somewhat lowly background in Stratford. The families named here as connections to Shakespeare’s family were anything but lowly. The Throckmorton family traced its history to the 12th century and had two baronetcies in two branches of the family. The family lineage can be traced in tudorplace.com. An example of many members of note is Robert Throckmorton of Coughton, born 1451, who was Privy Councilor to Henry VII. Another was Sir Nicholas Throckmorton, born 1515, sewer in the household of Queen Catherine Parr, his cousin. After 1544, following the death of Catherine, Sir Nicholas spent some years in the service of Henry VIII’s illegitimate son, the Duke of Richmond, and eventually served as Queen Elizabeth’s ambassador to France from 1559-1562. The Webbe family. Sir Henry Alexander Webbe, servant to Queen Catherine Parr appears to be the most illustrious of the line of Webbes that can be traced back to Henry Webb (1350-1397?). However, all of those listed from Henry Webb to Abigail Webb share the honor of being ancestors of William Shakespeare, for Abigail Webb, Sir Henry Alexander Webb’s sister, married Richard Shakespeare, and they were the parents of John Shakespeare, father of William (see table below). They were also related to William’s mother, as detailed above. Grace Arden (1512- 1539) D of Thos Arden, sister of Robert Arden (1506- 1556). 1st cousin of her husband. The Arden family is one of only three families in England that can trace its lineage to before the time of William the Conqueror (James Lees-Milne. Burke’s Peerage/Burke’s Landed Gentry, volume 1, as cited in Wikipedia, Arden family). The extensive biographical sketches of earls and noteworthy members of the family can be found in A Genealogical and Heraldic History of the Commoners of Great Britain by John Burke, pp 637-640. To judge from the ties the country bumpkin’s parents had with old, powerful families of the upper classes and with Queen Catherine Parr, it should come as no surprise that William Shakespeare understood their demeanor and language well enough to incorporate it convincingly in his plays. Shakespeare’s family surely was proud to be acquainted with and related to royalty, although for her Catholic relatives, Queen Catherine Parr must have epitomized the religious conflict that was to plague the country until the Roman Catholic Relief Act, passed by Parliament in 1829. Enos, Carol Curt. “WEBBE/ARDEN/SHAKESPEARE Families.” Shakespeare’s Cheshire and Lancashire Connections and His Tangled Family Web. Parker, Colorado: Outskirts Press, 2016. Stopes, Charlotte Carmichael. The Third Earl of Southampton. Cambridge UP, 1922. Wikipedia, Arden family. Reference to article by James Lees-Milne in the 18th edition of Burke’s Peerage/Burke’s Landed Gentry, volume 1.